I don’t know how authentic any of the Moroccan food I’ve eaten is. 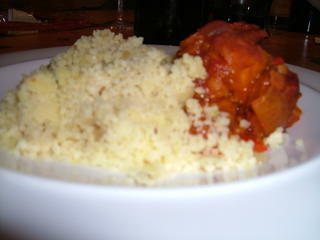 Certainly, none of it has been consumed in Morocco – I’ve eaten in plenty of cous-cous restaurants in France, though. There’s an undercurrent of very particular, seductive spicing that runs through all of the tagines and cous-cous dishes I’ve had there. 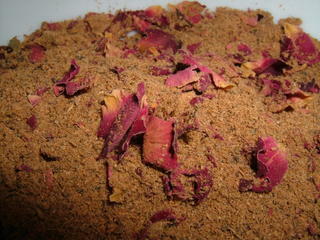 That undercurrent is Ras al-Hanout, which is Moroccan for Top of the Shop. It’s a blend of spices which varies from maker to maker, but which usually contains about twenty different ingredients, including nutmeg, lavender, nigella, cardamom and other good things. A pre-blended Ras al-Hanout is available in the UK from Seasoned Pioneers (Sainsbury’s carry their dear little foil packets in its exotic foods aisle), and it’s extremely good; the list of ingredients on the packet includes lavender buds and the rose petals you can see in the picture. I’ve got some friends coming round for dinner, and they love complex, spicy foods. I rub the Ras al-Hanout (with some extra coriander, cumin and nutmeg which I’ve ground in the mortar and pestle) into some lamb neck fillets, brown them, add some diced aubergine, garlic and tomatoes. I’m not going to slice one of these chaps open, because it’ll kill everybody who tries to eat my lamb. I drop one, whole, in with the tomatoes; it should infuse the dish with its heat in a more gentle way than it would have if I’d cut it open and unleashed its seeds. 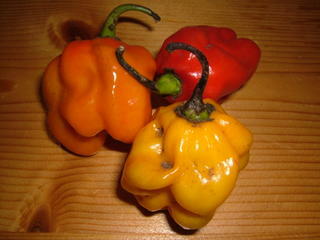 Much of the heat of a chili pepper is in its seeds and in the white ribs which support them inside the fruit. These are delicious little peppers, but they need treating with a great deal of respect if you don’t want chemical burns. 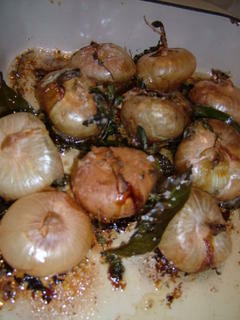 After an hour at 180c, the onions are sizzling in their papery skins, ready to be popped out and smeared on some bread, along with their buttery juices. The aubergine and tomato have melted into a spiced sauce for the lamb, which is tender and fragrant (and not very photogenic). I have been tagged by the Great She Elephant. This, apparently, means that I have to let you know twenty random facts about me. 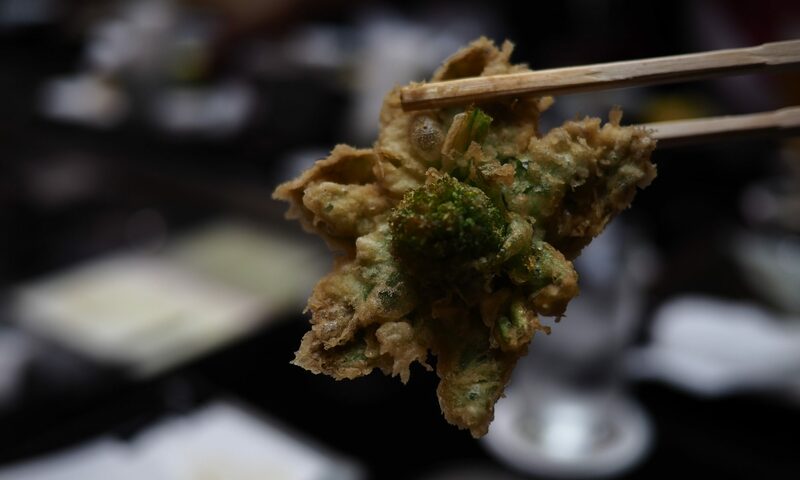 You’re only going to get the food-related ones – I am both obsessively private, and intent on keeping this blog on topic. I am seriously allergic to lobsters. Only lobsters; not crabs, langoustines, prawns, shrimp or other crustaceans. I’ve ended up unable to breathe, having adrenaline injected into my bum, twice as a result of this. It causes me untold woe, for nothing is nicer than a fat lobster in buttery juices. I ate ants eggs in an E-San/Thai restaurant in Cambridge recently, and thought they were absolutely delicious. Merely watching my gleeful crunching caused my dining companions serious intestinal disquiet. I regularly got atrocious marks in my end-of-term Home Economics reports. This was because we lived opposite the teacher, whose greengages, raspberries and gooseberries I used to scrump, and who also took my class for needlework. My poor marks were my reward for theft and grotty sewing skills. When at boarding school in London I used to save up my pocket money and spend it all in one go on dim sum at the New World. I inherit from my Chinese dad a passion for foods which are both salty and sweet at the same time. I pour salt on apple crisps, and sugar on chevda from the Indian supermarket. Part of the reason we bought our house was its location. It’s next door to a pub with a restaurant that serves scallops with samphire, local meats, a brilliant bread pudding and local beers. Sorry. I’m not telling you where it is. I lack a sweet tooth. I’d rather have starter than pudding, thank you. Coming home from abroad leaves me a nervous wreck, due to the vast quantities of food I’m usually smuggling through customs. It is amazing to see how many jackfruit chips you can fit around your flip-flops. We are going to Delhi for a wedding in a week and a half. I am not excited about the Taj Mahal. I am excited about the curries. Foie gras is one of my favourite things in the world. When I was a kid, my parents took me and my brother to stay on a goose farm, where gavage was carried out daily. The geese seemed to enjoy it, and I’ve never had any qualms about eating the results. There are things I like to eat that I really shouldn’t. Step up, Dairylea Dunkers. The shame is nearly intolerable. There is a jam jar full of MSG in my spice cupboard. When I was a child, I used to eat paper to relax. Now I’m an adult, I cook to relax. My grandmother once caught me licking up the honeydew deposited by aphids in her greenhouse. I was unapologetic. I adore caviar, but I’m not sure whether it’s because it tastes so good, or whether it’s because it’s so expensive. There are currently enough bits of duck confit in my cupboards to construct ten Franken-ducks. I once drank a bottle of tequila dry with a friend, aided by a salt pot and a carrier bag of limes. By the time we’d got to the bottom, passed out and woken up again, the agave worm was missing. We’re still not sure who drank it. I try to make my husband do all the washing up. Apparently I need to pass this misery on, so I am tagging my brother, who is blogging furiously from Bordeaux, where he has moved in order to ingest more cassoulet, and who is, I think, likely to respond with his own twenty things through ties of brotherly love. Right, Ben? I will also tag my very dear friend Helen (flattery will get me everywhere), who will, I hope, forgive me. Helen doesn’t get to cook much; she lives on a boat. Come around for dinner, Helen. At work, my lunchtimes are regularly spent gossiping with friends over a pub baked potato. There is nothing wrong with baked potatoes; indeed, a baked potato can be a thing of wonder (something I hope to demonstrate in the coming weeks). The pub baked potato, however, is a sad, microwaved thing, whose cheese has been melted under heat-lamps as it waits to be served. More often than not, this means that the salad which has been shoved on the side of the plate is melting too. So. 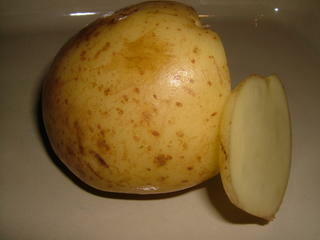 It’s time to rehabilitate the potato. I love gratins; especially at this time of the year, when it’s getting cold, there is nothing nicer than lovely, starchy potato which has absorbed its own weight in scented milk and cream. 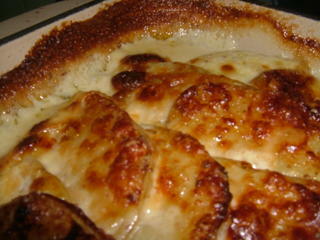 You can make a whole meal of a gratin by adding extras – I had some smoked mackerel from Spinks in the fridge. A mackerel gratin is just the thing to start me feeling good about potatoes again. 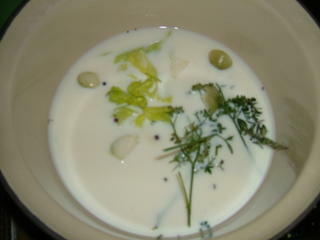 I start out by infusing 240ml of milk with some thyme, a bay leaf and some parsley from the garden. This is a great application for the woody flowering tops of the parsley I can’t use to garnish (and which I should remove to make the leafy part of the plant more bushy). They’re very fragrant, and are perfect for this. I also add some celery leaves from the centre of a bundle in the fridge, a crushed clove of garlic, a clove, three peppercorns, a quartered shallot and some salt. The milk comes to a simmer and is taken off the heat while I slice the potatoes. It’s important to slice the potatoes very thin. I wish I had a mandoline – a device to slice vegetables very evenly, and very thin. I make a mental note to go to the kitchen shop soon. Slicing the potatoes thinly increases the surface area that’ll be exposed to the wet ingredients, and so increases the starchyness of your finished gratin (your sauce will be thicker); it’ll also result in a crisper finish. I layer them in a thick-bottomed, enamel dish, which has been buttered to within an inch of its life. 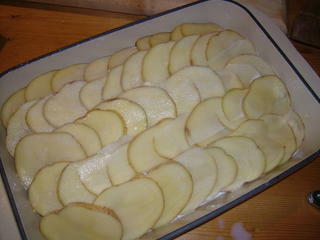 One fillet of smoked mackerel goes on top of this, flaked, and then a final layer of potato goes on top. The house begins to smell very, very good. Once the cream has come to a simmer, I remove it from the heat, and strain it into a jug with a tablespoon of grainy Dijon mustard. Twenty minutes later, most of the milk has been absorbed into the potatoes. I pour over the cream, sprinkle a little finely grated parmesan over the top, dot with butter and return the dish to the oven, without the tin foil. (I love my Microplane grater; I spent years sweating over grating solid chunks of parmesan, but I got a Microplane after I saw one being used in an Italian restaurant and asked what it was. 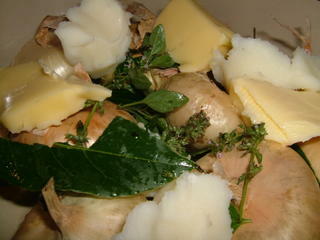 It also does a beautiful job of pulping garlic and ginger.) I’m careful not to add too much parmesan; it’s there to flavour, not smother. The gratin sits in the oven for another 25 minutes. When it comes out it is crisp and golden, and the creamy sauce is bubbling gently between the slices; the underside is golden too, and there is a soft, smoky layer of unctuous, creamy potato and mackerel in the middle. This is how autumn food is meant to be. Thankfully, I do not own a heat lamp, so the (bagged) salad is crisp and does not go wet and stinky on me. Those particularly interested in the lore of the gratin, and the reasons for the wonderful, lactic taste that all of this messing around with potatoes and cream produces, should go directly to Amazon and buy everything Jeffrey Steingarten has ever written. This will not only inform you in wonderful, systematising detail about the miracle that occurs in your gratin dish, but will keep you implausibly happy in the bath for as long as it takes you to read it all, and then for the half hour (turn the hot tap on at this point; things will be getting a little clammy) it takes you to bemoan the fact that there isn’t a third volume. We had two sets of friends round for lunch today. This presented a bit of a problem; first off, they’ve both got very small children I like spending time with, and the children create problems with punctuality. It is remarkable, according to parents I know, how nappies are filled, vomit is produced and knees grazed the very minute you want to leave the house. I needed to cook something I could leave on the stove for an hour or so, in case of lateness, and which would also need little attention if I wanted to play with the kids. I ended up with a weasely interpretation of a Gordon Ramsay chorizo casserole, first introduced to me by my teetotal mother-in-law. I am not, of course, worthy to make changes to recipes by the divine Gordon, but I am also considerably too big for my boots, so I have made changes with gay abandon. Split red lentils are a real store-cupboard essential, ready to be thrown into a winter soup or stew as a natural thickener. 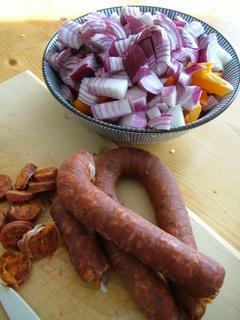 Chorizo is another useful winter standby – it keeps in the fridge indefinitely and will jazz up all manner of dishes. 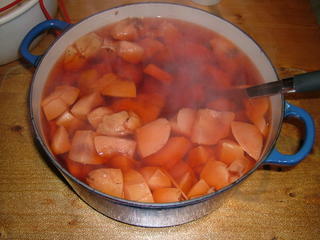 1 Cut the chorizo sausage into fairly thick chunks, about 2.5cm long. 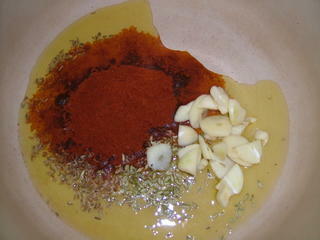 Heat the oil in a large sauté pan or casserole, add the paprika and garlic, and cook for 30 seconds. Add the sausage, onion, celery and peppers. Cook for 2-3 minutes or until the sausage begins to sizzle. 2 Add chicken stock, tomatoes and lentils, reduce the heat and simmer for 1-2 hours. 3 Sprinkle with the fresh herbs and serve immediately. from the pen of Gordon, Canon of the Casserole; for six people I use two chorizo, a couple of tablespoons of paprika, a teaspoon each of fennel and cumin seeds with the paprika, and four peppers, leaving the amounts of onion, celery, stock and tomato the same. (I cheat and use two tins of plum tomatoes.) Towards the end I add a wine glass of marsala (anathema to my poor mother-in-law, who doesn’t know what she’s missing) and about half a lemon’s worth of juice. What is it with the British and paprika? Here, it’s sold in pathetic quantities; you buy it in spice jars of the same volume as those they sell star anise, coriander seed and . . . everything else in. For a while now I’ve been buying spices and herbs at Daily Bread, a wholefood warehouse in Cambridge where they sell them by the jam jar or by the enormous plastic bag. They’re mildly barking wholefood Christians, but the spices are great, so I ignore the God stuff and just pillage their shelves, thinking wicked, gluttonous thoughts. There is no point in buying a pathetic pot of paprika from the supermarket; this recipe (like many Spanish and Hungarian recipes) requires two tablespoons of the stuff, which means a good half-pot in supermarket terms. Paprika is powdered, dried capsicum or red pepper; it isn’t chile-hot like cayenne pepper, but has an almost smoky, deep sweetness. Here is a phenomonal amount of powdery redness with the fennel, cumin and garlic. I fry all the spices together in olive oil, then add the chopped vegetables, and stir-fry with vigour, dancing all the while in an inappropriate manner to a kid’s album by They Might Be Giants, in an attempt to get in the mood for the four small visitors who are arriving soon. The chorizo rings do contain some chili, but not enough to hurt little mouths. 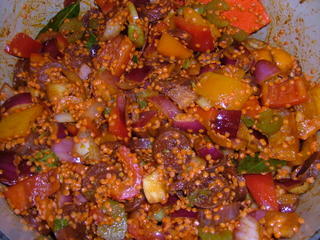 Once the vegetables are blanched, I add the lentils, stir fry a little longer, and then add the tomatoes and liquids. This will now be perfectly happy sitting on the stove for a few hours, which gives me ample opportunity to do my dinosaur impressions in the living room once my guests arrive. We serve up lunch with a good splodge of cous-cous, flavoured with shallots, fennel, cumin and coriander. The kids throw a lot of it around, but also ingest a surprising amount. My work here is done. The children later gravitate to the television, which we have pre-prepared with lots of DVDs of cartoons by Hayao Miyazaki. We grown-ups sit around the kitchen table, drinking a ridiculously potent chestnut liqueur which I bought in France on holiday. One Dad tells me that we must invite them round again soon; he likes the way I cook. Here in the Weasel household, we get through a hell of a lot of garlic. Especially during the very short period in the year (around July) when you can buy green garlic (this is garlic which is fresh from the ground and has not been dried; green garlic has a very sweet, delicate taste and roasts magnificently), we spend a fortune; the supermarkets ask a premium for it. Rather than paying my entire salary to European garlic magnates, I decided that this year I’d plant some. You don’t have to buy any special kind of garlic for growing; the stuff you buy in the supermarket is fine. I bought a bulb of elephant garlic (a giant variety – it’s quite unusual to find it in the shops in the UK, and I ended up paying £4 for my precious, half-pound bulb at the Burwash Manor Larder, a delicatessen near Cambridge), and a net of regular garlic bulbs. You can see the difference in size here; the bulb on the right is normal garlic (and the same size as the garlic you probably have in the kitchen now). The elephant garlic is . . . elephantine. It doesn’t taste as strong as smaller varieties, but it’s a good roaster, and the individual cloves are huge and beautiful; this bulb (bigger than my fist) only produced four cloves, each of them enormous and juicy-looking. In the UK, it’s best to plant garlic in October, although some garden centres carry a specialist garlic you can plant in the spring. October-planted garlic will be bigger and taste better. It’ll be ripe in the summer. It’s an unattractive plant (which is why I have decided to only give one bed in my rather small garden up for it, along with a container – I want to see whether it performs best in the container or in the ground), but much more of it is edible than the parts you can buy in the supermarket; the shoots which are produced in the spring can be eaten like a gorgeously garlicky spring onion, and the scapes (the flowering heads), which have to be removed to increase the size of the bulbs, can be cooked as a vegetable; they make a magnificent stir-fry. It’s worth making a bit of the garden look mildly hideous until next July. 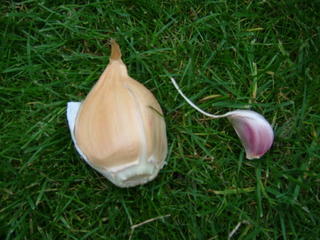 The larger the individual clove you plant, the larger the bulb of garlic it will produce next year. This is one of the four cloves of elephant garlic with one from the supermarket. 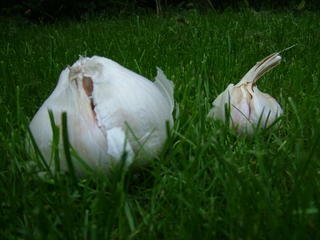 I was lucky; both bulbs of supermarket garlic had large, evenly-sized cloves. I haul the remains of this summer’s sweet peas out, dig in some compost and plant the garlic – the elephant cloves go in 15cm deep, the others 10cm deep. I leave enough space to make sure there’s enough room for the bulbs to grow nice and big. I wish Waitrose were still selling solo garlic, a Chinese variety which is much more mellow and creamy than regular garlic, and which grows as a single, spherical clove. My Dad’s Chinese, and he remembers eating it as he was growing up. Garlic is immensely important in Chinese cooking. There are references to the bulb in Chinese literature from four thousand years ago, where lambs prepared for sacrifice were sprinkled with garlic to make them more appealing to the gods. I think I’ll sacrifice a chunk of lamb larded with garlic to . . . myself some time next week. I had a boyfriend whose mother, a teacher, refused to eat garlic in any form, in case her students smelled it on her breath. What a waste of eating opportunities. Parsley is meant to help deodorise the breath, and red wine is supposed to help too, if you’re the sort to worry about that kind of thing. If you worry about the smell on your hands after you’ve been cooking with it, you can get rid of it completely by rubbing your hands with a piece of stainless steel (a teaspoon will do) under a running tap. I have no idea how this works, but it does; try it. (It also works on unpleasant perfumes which have been sprayed on you as you pass a keen shop assistant.) 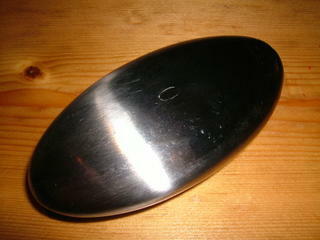 I use this rather natty, hollow, stainless-steel pebble, which I got from John Lewis; you can also buy them online at Royal Doulton. I didn’t make any quince jelly last year; the quinces on the tree at my Mum’s house came ripe and then dropped off while I was busy getting married and going on honeymoon. This was an ill-considered piece of timing on my part, and resulted in a year of married bliss with no quince jelly. Catastrophe. This needed putting right before we found each other weak and snappish at the lack of sugar, our marriage under intolerable, hypoglycaemic strain. 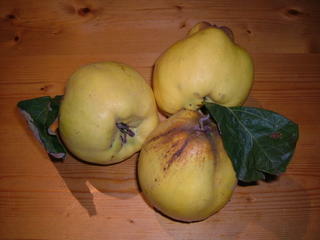 Quinces are a lot like a large pear in appearance; they’re also covered with a soft, furry down. They smell extremely fragrant, but they’re not edible raw; a raw quince is very hard, astringent and bitter. Cooked, however, they change in character completely. They lose their golden-yellow colour and their tart taste, and become pinkish, soft and intensely scented. INGREDIENTS – To every pint of juice allow 1 lb. of loaf sugar. 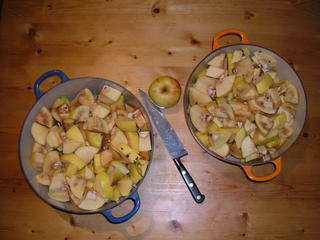 Mode – Pare and slice the quinces, and put them into a preserving-pan with sufficient water to float them. Boil them until tender, and the fruit is reduced to a pulp; strain off the clear juice, and to each pint allow the above proportion of loaf sugar. Boil the juice and sugar together for about 3/4 hour; remove all the scum as it rises, and, when the jelly appears firm when a little is poured on a plate, it is done. The residue left on the sieve will answer to make a common marmalade, for immediate use, by boiling it with 1/2 lb. of common sugar to every lb. of pulp. 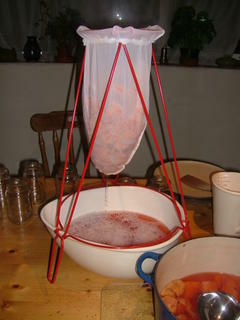 Time – 3 hours to boil the quinces in water; 3/4 hour to boil the jelly. Ripe quinces often have small brown patches inside, as in this picture (they’ll get browner as they sit in your pan and the oxygen gets to them, too). Don’t worry. It doesn’t mean your quince is bad. My Mum, who taught me to make this, always insisted that it’s important that you leave the seeds in, but I do wonder whether she’s confusing quinces with citrus fruits, where the seeds are important in jam-making for the pectin, the enzyme which makes the jam gel properly. I give her the benefit of the doubt and leave them in anyway. I also deviate a little from Mrs Beeton here; I don’t pare (peel) the quinces, having discovered a few years ago that it doesn’t make any difference to the finished jelly; you’ll want to peel them if you intend on making the marmalade (quince cheese) that she mentions, but I’m not intending on doing that; there’s little enough room in my cupboards as it is. About twenty chopped quinces fill my two largest Le Creuset pans. I’ve plonked my knife and an apple between the pans so you can get an idea of scale – these pans are 26 and 28cm in diameter – this is a lot of chopped quince. The largest pan (the blue one) needs about three litres of water to fill it enough to make the quince bits bob about merrily, the orange pan about two and a half. Simmering for three hours will reduce the quince to a pulp in a gorgeously pink juice, and will scent your whole house with a honeyed, fruity perfume. I used to strain jellies by lining a sieve with butter muslin and balancing it precariously on top of the bowl I was straining the jelly into. This year I have seen sense and bought a proper jelly bag from Lakeland. I’m not impressed; the metal stand is coated with red plastic, but the plastic is flaking off the ring around the top as if it’s got a particularly nasty skin disease. I need to be careful that none of it ends up in the jelly. The bowl I want to strain into is too big for the stand. It has to balance on it precariously. My hairy-handed sous chef, Mr Weasel, will need to hold it steady when I put the pulp in the bag. 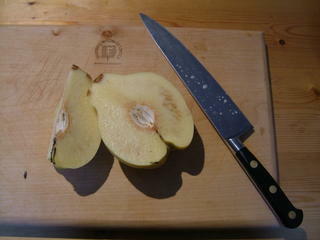 Quinces contain enough pectin to gel naturally, but the set you get from quince-pectin alone is quite soft. 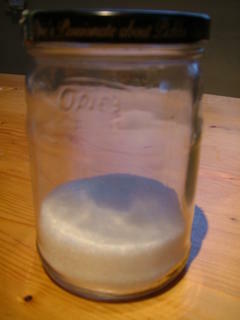 I prefer a harder set, so I use jam sugar, which comes with pectin already added. The orange pan yields five pints of juice, the blue one six. Bugger, that’s a lot. I don’t have enough jam jars. Today’s most shocking discovery is that it’s cheaper to buy Tesco Value marmalade and throw it away (31p per jar – and this is difficult, because throwing perfectly good food away makes me feel physically ill – but what do you do with six lb of jarless, cheap jam?) than it was to buy my pristine jars and lids from Lakeland (about 50p, including the lid, which has to be bought separately). Mr Weasel, craving jelly, drives to Tesco and buys six jars of sacrificial marmalade. 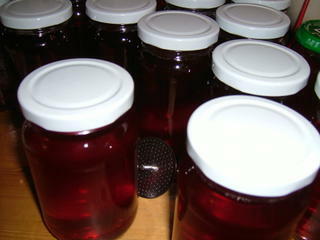 After 45 minutes of simmering (with no lid), 22lb (10 kilos) of quince jelly is ready to go into the sterilised jars. This should be enough to go on crumpets, accompany and glaze roast lambs, drizzle over blue cheeses and make presents for the neighbours until next autumn.